So it's not too bad, considering. Last edited by hoe; 26-08-18 at 05:58 PM. nbn appointment is on wednesday and tech needs to come to premises - wtf ? Last edited by hoe; 01-09-18 at 09:51 AM. Yep. Just got Telstra business nbn at my house and they insisted a tech come to the house even though internet was already up and running. His job was to set up the phone service in the modem and setup the 3G/4G dongle backup (Huawei E8372D) in case of outages. Waited 4 hours for him to arrive and 5 minutes to set it up. I am also now the proud owner of two gateway pro modems (Netgear V7610-1TLAUS) due to their ordering efficiency. Last edited by mandc; 01-09-18 at 08:14 AM. i got a technicolor modem with built in lte modem and sim already inserted. nothing for tech to do, as i dont have phone number to worry about and its already synced and waiting for switch over. Last edited by hoe; 01-09-18 at 09:57 AM. Back when I was with Aussiebroadband using the Ipstar satellite, they said they had their 'Uplink' at Kalgoolie, same or separate facility? I think another one was at Mooree in NSW. They tried to tell me they had a link at either Cairns or Townsville in FNQ. Last edited by hoe; 05-09-18 at 02:41 PM. hmm, telstra modem died, keeps dropping connection. I think these 40+ degrees days killed it, as its in the shed next toofce where the line enters. Last edited by hoe; 03-01-19 at 10:27 PM. 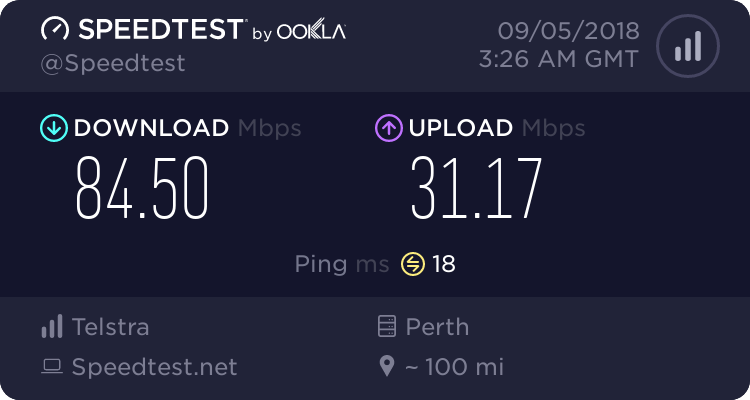 note the 12db+ snr now, thats with my d-link taipan connected, telstra modem syncs at a slightly higher upload and lower download. watching full hd iptv last night, not one single glitch. before it used to glitch occasionally, so maybe speed isnt everything. I used to find the same thing on adsl. adjust the snr to get a higher sync and the errors slow you down. Not sure what changed, it only started happening since the temperature got into the high 30's - low 40's, maybe the node is overheating. My iptv has been perfect since I was put on an nbn stability profile with 12db snr. Sync speeds are slower but no errors. Down to 76/33 now using a new gen2 telstra arcadyan modem with no issues at all. note: dont even think about using it until it updates to at least 6.07r firmware, currently the latest. earlier firmwares were very buggy. Dlink python syncs slightly faster, but no phone and no backup 4g. Networking, multiple vpn, dlna all working perfectly. custom dns supported and has most popular servers available via drop down menu. im using cloudflare. Note ipv6 must be enabled for this modem to work properly as the backup 4g system is dependant on it and with it disabled you will have dns issues using vdsl. Modem does not support Nat loop back but its generally not needed when using ipv6. 2 dect handsets connected directly using modem as base station and one phone using port on modem. Intercom feature fine and handsets can be configured to receive certain calls or not. Also has call filtering and blocking. Auto 4g backup works fine and phone service works when in backup mode. Phones do not work in bridge mode though. Getting 7 to 8 mbps downloading torrents using vpn to Taiwan. Last edited by hoe; 08-04-19 at 05:46 PM.